Karma died on August 21. 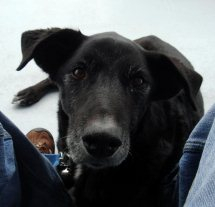 He was a 12-year-old rescue dog who spent the last five years of his life with friends Paul and Heather up in Traverse City. I haven’t seen Karma in a long time – about a year and a half – but I’ll always remember his gentle nature, his desire to please and be near people, and his expert companionship on the trail. 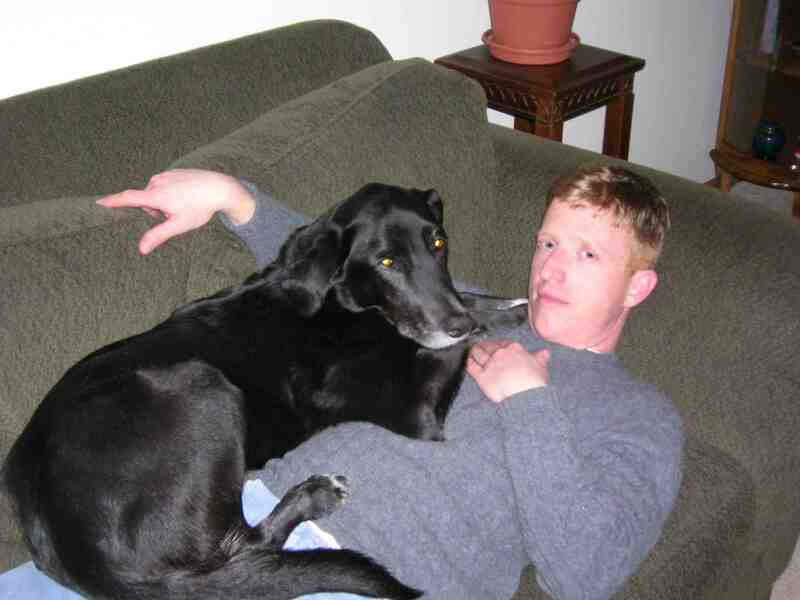 He usually slept with me when I visited, and he generally followed my requests and commands better than my own dogs. Sweet Karma. Karma’s past is sketchy, but he definitely suffered some sort of physical abuse, probably prolonged. (Paul suspects there may have been some irreparable brain damage.) He was never able to fully recover, and I was always amazed at his ability to love and trust humans in spite of his setbacks. I think the first time I met him he was pretty much glued to me like a long lost best friend. Of course Paul and Heather’s love and understanding of animals – their general philosophies pretty much mirror mine – had everything to do with Karma’s rehabilitation and his success at becoming a necessary member of a new pack. I’m so glad he found P&H. Not everyone would be as patient with his quirks as they were. They were certainly challenged by dealing with Karma’s idiosyncrasies, but they never stopped loving him, and now they miss him terribly. I have several memories of Karma, but the strongest is from a visit Jane and I took up north in December 2008. Jane had just been with me a couple of months, and she was an absolute wild thing. Paul and Heather had three indoor cats at the time (fearless old Mao has since died), and Jane spent all of her indoor time treeing them on desktops and bookcases. The only way to get Jane to calm down inside was to run her for three solid hours in the snow every day. (This holiday actually gave birth to the exercise regimen that we follow to this day.) The snow was deep, and the woods where we walked were hilly. Each morning I took Jane and Karma out for a two-hour run – Karma off-leash and Jane on a 20-foot lead. I’ll never forget Jane’s need to go go go go go – no time for resting or reflecting. She dragged me behind, knee-deep in snow, sweating buckets in the 20-degree deep freeze. And there was Karma, smiling, perhaps a little bit confused (his human companions were overseas), but up for whatever Jane and I dished out. He was so kind, so thoughtful, and he exhibited such tireless sportsmanship. Karma was a real gentleman. Yesterday was the second anniversary of Georgia’s death. My cry didn’t last as long this year, and I realized that I spend more time now thinking about Jane than I do Georgia. That’s not to suggest that I don’t think of Georgia multiple times every day. Framed pictures of her remain just where they’ve always been throughout the house, and I still catch glimpses of her around every corner and in every shadow. Georgia’s taught me what it means to live with death. It’s still sadness, but it’s now mixed with a certain sweetness, joy, and hope that I can’t quite put my finger on.